Support for this compound search method is provided as standard. This identification method is intended to support identifications from a number of different compound databases. It allows you to choose a .SDF, .CSV, .XLS or .XLSX file containing identifications and information on a selection of compounds, and search for matches by neutral mass. It also allows you to search retention time and CCS values using additional properties files, and fragmentation data using either theoretical fragmentation patterns or fragment databases. The MetaScope search method, with example parameters chosen. 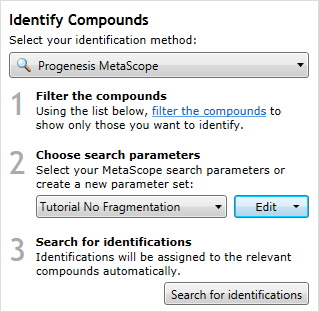 In the Identify Compounds screen, filter the list of compounds to show only those that you want to identify. Choose a set of search parameters from the Choose search parameters drop-down (you might need to first create or edit a search parameter set. See the section on search parameters below for how to do this). Click the Search for identifications button. When the import and search is complete, a prompt will tell you how many compounds have been identified. You can then continue with your analysis, identifying further compounds if necessary by searching with other parameter sets. MetaScope comes with a number of built-in search parameter sets, to show you the kind of parameters you can set. However, you'll probably want to create your own or modify the built in parameter sets. Give the search parameter set a useful name to refer to later. Choose either an SDF or CSV/XLS/XLSX file containing compound information. Choose the threshold (in ppm or Da) within which the neutral mass must lie to constitute a match. Choose the threshold (in minutes or %) within which the retention time must lie to constitute a match. 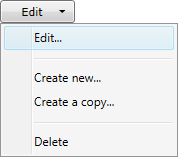 Can be turned on or off using the checkbox. Choose the threshold (in % or Å2) within which the CCS must lie to constitute a match. Can be turned on or off using the checkbox. Will be disabled if the experiment contains no CCS data. Allows you to load additional compound properties (e.g. RT and CCS) from an external file. See What are additional compound properties files? for more information. 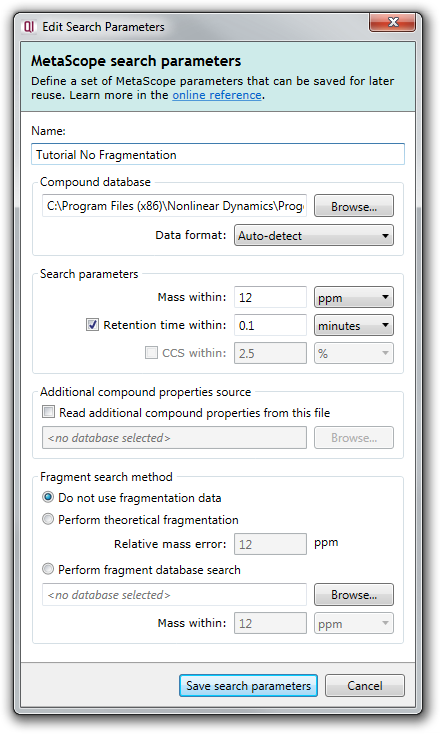 Allows you to choose between no fragmentation search, search against theoretical fragmentation, or search against a fragment database. See What are fragment databases? for more information. After entering your search parameters, click Save search parameters to save your search parameter set for use in this and future experiments. The SDF format contains structural information and other associated data about the metabolites in the database. You can choose to continue the search without the components that couldn't be read, although the search may not find all of the expected compounds this way. The Progenesis SDF Studio can help you fix the problems with the SDF file. Retention Time (min) If Retention time within checked. Field names are case insensitive and can occur in any order. You can also download an example database. Note: you will need to have Microsoft Excel 2007 (or later) installed to perform the search. What are additional compound properties files? Why is fragmentation data required to be in a separate file?